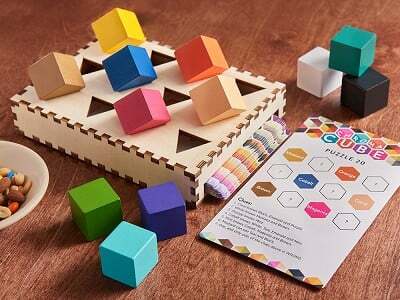 Project Genius is all about finding creative games for kids (and grown-ups, too) that spark puzzle-solving fun in a beautifully made package. Chroma Cube fits the colorful bill. 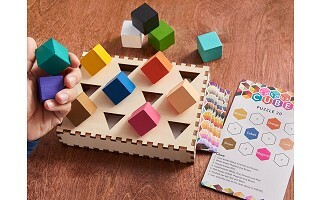 It’s a wooden puzzle-game hybrid that is great to look at and fun to play with, which is a parent and kid win-win. 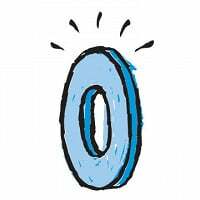 The game helps hone early reasoning and logic skills and is made with a timeless, meant-to-be-seen approach that won’t feel outdated as kids grow. Kids follow the clues in the card pack and try to arrange the cubes accordingly. Stumped? The solution is on the back of each card. When little ones are done playing, Chroma Cube is an artful addition to a coffee table or bookshelf. What ages is this recommended for? How many puzzle cards are included in this game? The game includes 25 puzzle cards. 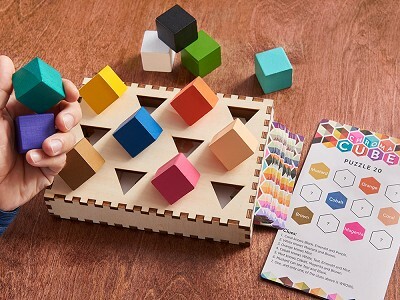 Project Genius is all about finding creative games for kids (and grown-ups, too) that spark puzzle-solving fun in a beautifully made package. Chroma Cube fits the colorful bill. It’s a wooden puzzle-game hybrid that is great to look at and fun to play with, which is a parent and kid win-win. The game helps hone early reasoning and logic skills and is made with a timeless, meant-to-be-seen approach that won’t feel outdated as kids grow.